The little blue guys -- and girl! 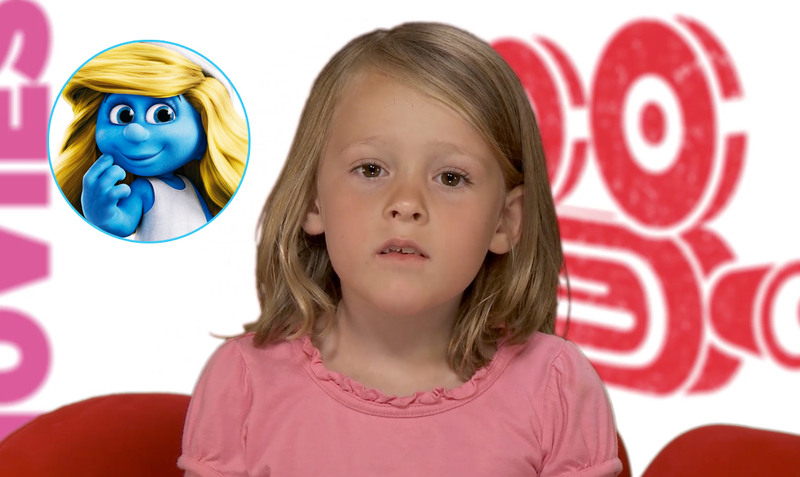 -- hit movie theaters today in The Smurfs 2, and CC and I got a chance to review the movie for mom.me's video feature Kid Rated, Mom Approved. Wanna know what CC said? She's got the greatest line in her review. Check it out! And if you get a chance to see the film, let me know what you think. In this smurfy sequel, Smurfette (voiced by Katy Perry) is feeling yes, blue, because it seems the smurfs have forgotten her birthday. That leaves her vulnerable for when Gargamel (Hank Azaria) wants to kidnap her and bring her to Paris -- his new home -- to get the secret recipe for smurf essence. He uses his new creations, the Naughties (who are not quite smurfs; voiced by Christina Ricci and JB Smoove), to lure Smurfette away. But Papa Smurf (the late Jonathan Winters) is not having it, and brings friends Patrick and Grace (Neil Patrick Harris and Jayma Mays) to Paris to get Smurfette back. My one-sentence review here: It's much better than the first one—and there's a sweet message about family and belonging. Those little blue creatures are back -- and this time they're headed for Paris! CC and I caught a sneak-peek screening of The Smurfs 2 last week at Sony, and we had a great time meeting up with friends and checking out who exactly these new "naughty" characters are. The story has Smurfette (voiced by Katy Perry) feeling blue (sorry) because she thinks the rest of the Smurfs have forgotten her birthday. This makes it easy for meanie Gargamel (Hank Azaria) to lure her back to his new Parisian home (apparently he's popular over there). Of course he needs some help to do this. Enter "The Naughties" -- Vexy (Christina Ricci) and Hackus (JB Smoove) -- creatures who are like Smurfs but not exactly. Papa Smurf and the crew grab friends Patrick and Grace (Neil Patrick Harris and Jayma Mays), who have a son named Blue, and hit the City of Lights to get Smurfette back. It was fun, as usual, catching the film with CC. Now Baby Will is on board -- this is actually his second movie after the earlier Turbo -- and soon I'll have two little film critics. Stay tuned for a fuller review of the film! 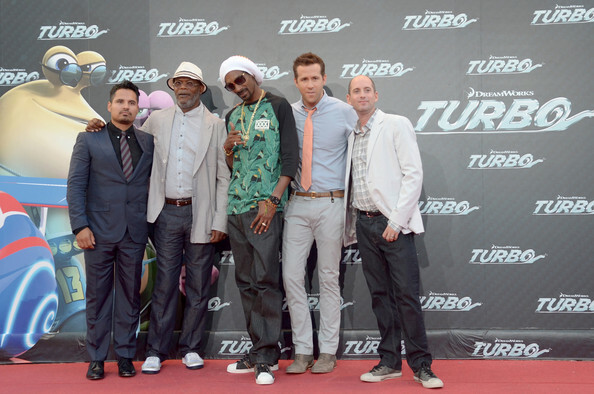 'Turbo' director David Soren, far right, with the animated movie's stars. Director David Soren, a dad who hails from Canada, chatted with a few bloggers, and I got my hands on his insights into the film. When it came to inspiration for the underdog snail racing story, Soren didn't have to go far. In fact, it started in his own home. "It was twofold," he said. "It was in part my now 6 1/2-year-old son who, since before he could even talk has been obsessed with all things fast, zooming his little race cars around my living room; and my front yard, which had a snail problem." And while snails seem an unlikely animal to choose to topline a racing movie, Soren admitted that was kind of the joke. "Who is more unlikely to be in a racing movie than a snail?" he asked. "And the story is ultimately an underdog tale and focuses on dreamers and realists," he added. "So it wasn't so much that it was necessarily a talking animal movie in my mind as much as a more universal thing." As Los Angeles denizens might have also noticed, there are tons of references to the city itself. After all, most of the "action" takes place in the San Fernando Valley. Soren, who lives in the Valley, said that was what made sense, given that DreamWorks Animation -- and his own house -- are in the Valley. "There's such an iconic look to the San Fernando Valley," he said. "and there's really a great history of racing movies and car culture here. So it seemed like the perfect location to set a racing movie and also an underdog story, since the Valley is sort of never quite considered the most desirable location to live." Check out my mom.me gallery featuring royal baby souvenirs. 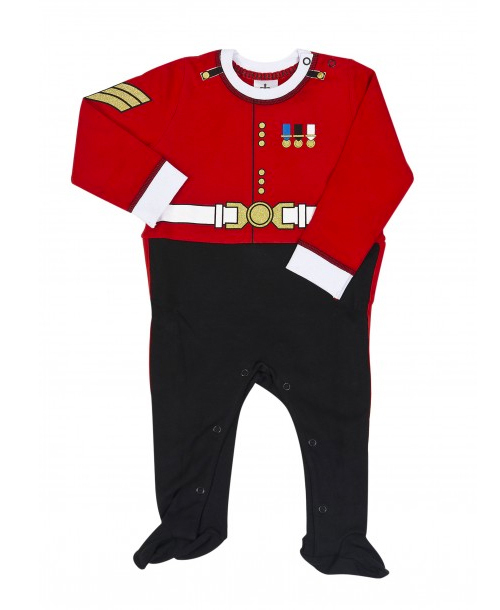 There is some really cute stuff available for your own little regal bundle -- and you can even have it delivered from Buckingham Palace, too! Get ready to rock out, kiddos! 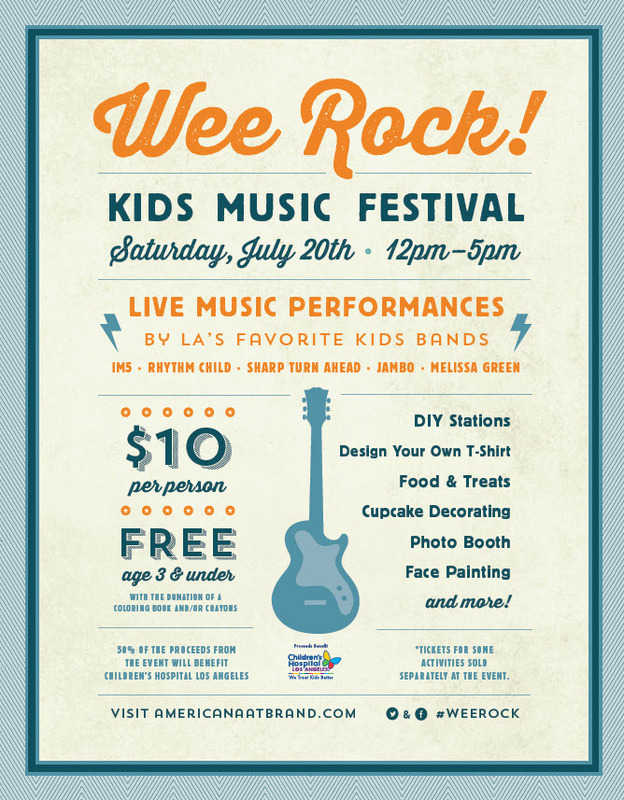 The Americana at Brand is hosting the Wee Rock! 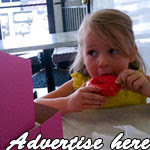 Kids Music Festival tomorrow, July 20, and there looks to be something for every kind of kid. 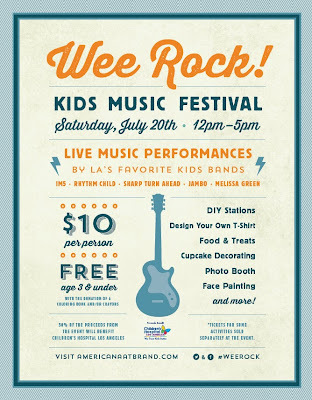 In addition to live music performances by kid faves such as Rhythm Child, Jambo and Melissa Green, there will also be stations where kids can design their own T-shirts, get their face painted and decorate cupcakes. That sounds amazing! What's even better is that 50% of proceeds will benefit Children's Hospital Los Angeles. Tickets for the event are $10 per person. Kids ages 3 and under are free with the donation of a coloring book and/or crayons. Kids, grab your 3D glasses and start your engines. Theo is a snail with a dream, and that dream is to do what snails don't do best—race. Turbo, a 3D film from DreamWorks Animation that hits theaters today, is all about believing in yourself, persevering—and getting a little help from friends along the way. From the moment we first see Theo (voiced by Ryan Reynolds), imagining himself as a contestent in a champion auto race a la the Indy 500, we know he's hooked. The visually arresting sequence (there are many in this 3D film) has Theo studying famous French racer Guy Gagne (Bill Hader) and testing himself, getting out the ruler and trying to beat his "fastest" time from one end to another. Let's just say two-plus minutes may be great when you're talking half-miles—not when you're talking one foot. His love of racing actually makes him an outcast in his happily slow community of snails, whose job it is to work in a suburban L.A. garden. Theo's brother, Chet (Paul Giamatti), a marshmallowy snail that might as well have "middle management" stamped on his shell, is often exasperated with his younger brother, who doesn't seem to fit in with the otherwise careful group. When Theo tries to outsmart a lawnmower to save a juicy garden tomato, well, it's not only fruits and veggies that get a little bruised in the garden. Egos get squashed when Theo and Chet are ousted. His hopes dashed, Theo visits a bridge that overlooks the 101 Freeway (an auto race in its own way), he makes a big wish—and gets it. After falling into the engine of a car, Theo takes on the characteristics of a race car—the lights, the music and, best of all, the speed. When he returns (quickly) to his brother to tell him the news, both Chet and Theo/Turbo get swept up by young taco truck driver Tito (Michael Pena). Turns out Tito runs a snail-racing game at his struggling Dos Bros taco shop in Van Nuys that he shares with his much more practical brother, Angelo (Luis Guzman). 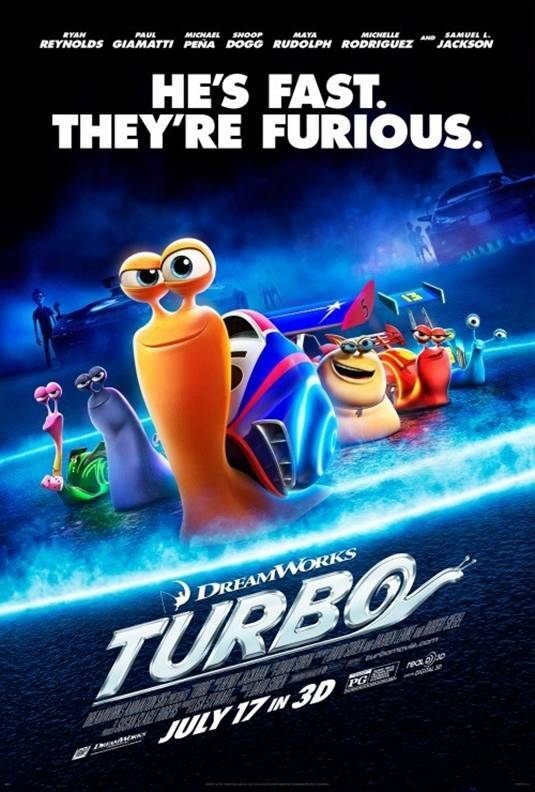 Enter a group of other racing snails, voiced by Samuel L. Jackson, Snoop Dogg and Maya Rudolph, among others. While they don't have super-powers, their attitudes are hilariously large and in charge. When Tito discovers Turbo's racing ability, everything goes into overdrive and they try to make it to the real Indy 500 to actually compete alongside race cars—and Turbo's idol, Guy Gagne. While the movie is a little slow (not to say a snail's pace) in the beginning, once Turbo and Chet meet up with the Dos Bros taco guys, the story and action really take off. 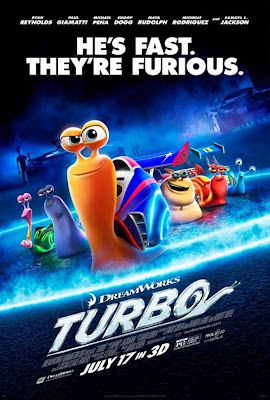 Turbo's trash talking with the Dos Bros snail crew is also a funny addition, giving Samuel L. Jackson one of the best lines in the movie (which I won't ruin for you here). The 3D film is perhaps best for younger viewers, who can always use the inspiring message that you actually can fulfill your dreams, with a little determination and luck. CC thought the movie was great and couldn't stop singing an Auto-Tune spoof that was featured in the film, called "That Snail Is Fast." It's so fun when you can bring a bit of '80s nostalgia into your child's 21st century, iPad-loving world. That she loves it is even better. That's exactly what happened when we watched The Smurfs: Smurfs to the Rescue!, a new DVD out today from Warner Bros. Home Entertainment (SRP: $14.97). While CC is no stranger to The Smurfs -- she loved the movie that came out a couple of years ago and is eager to see The Smurfs 2 -- she hasn't had a lot of contact with the shows made super-popular when I was a kid. And, I have to say, it was fun to bond with her over that. 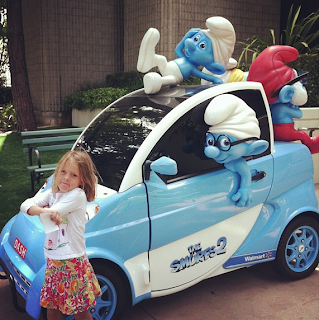 The DVD features six episodes, including Sideshow Smurf, where Smurfette, Lazy and friends need to escape from being an attraction in a traveling show. Also, we get to meet Johan and Peewee. Remember them?! It's so funny hearing just how many times they say "smurfy" or how those little blue creatures can replace any verb or adjective with the word "smurf." What was even better was sharing these moments with my own little smurf. Love this movie! What is especially great is that Grease, that awesome '70s movie-musical about good girl Sandy (Olivia Newton-John) and her greaser love Danny (John Travolta), will be presented once again as a sing-a-long at the Hollywood Bowl, on Saturday, July 13. Didi Conn, who starred as "Beauty School Dropout" Frenchie, will serve as host, and band Sha Na Na will perform! A-mazing. The pre-show kicks off at 7:30 p.m., and the movie starts at 8:30 p.m. Don't forget your Pink Ladies jackets! 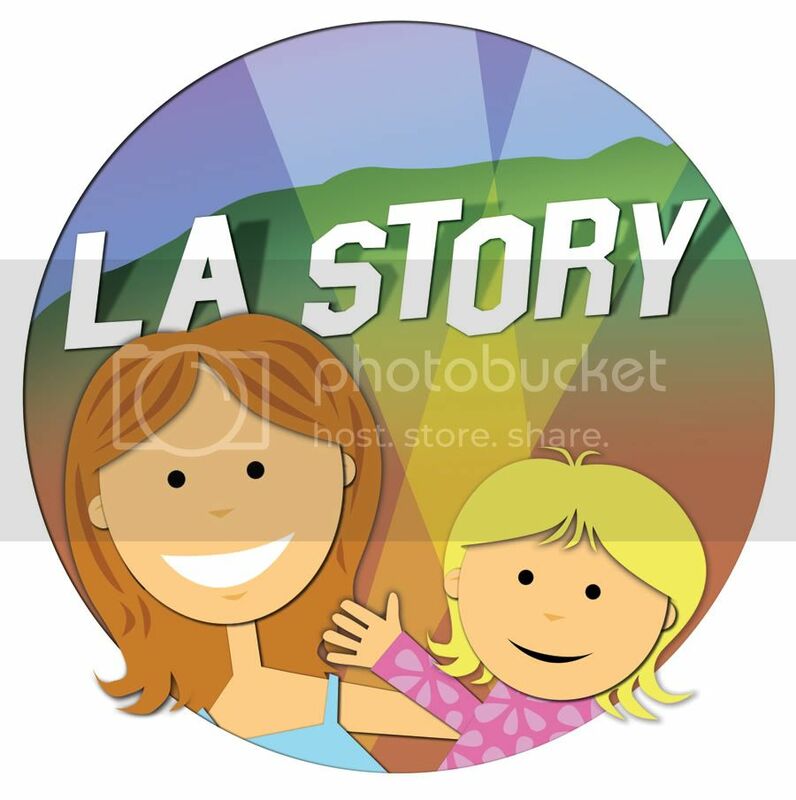 So excited to find out that L.A. Story was nominated for Circle of Moms' annual Top 25 SoCal Mom Blogs! What great news! I see some of my fellow SoCal mom friends on that list, which is also nice to see. You might know her as the no-nonsense, tough-loving Supernanny, but did you also know that Jo Frost has had to battle life-threatening allergies since she was 4 years old? I had the chance to catch up with the famous parenting expert, who just kicked off her new show Family S.O.S. this summer on TLC. Frost has partnered with EpiPen to celebrate the epinephrine auto-injector's 25th anniversary (25YearsofEpiPen.com). She talked to me about her own allergies (she's allergic to nuts and shellfish) and how parents can prepare even if they've never had experience with anaphylaxis. (I know I hear about EpiPens for CC's school and camp and would love to know what to do if she had a friend over who had life-threatening allergies.) Here is an edited excerpt. L.A. Story: Tell me a little about your partnership with EpiPen and the 25-year anniversary. 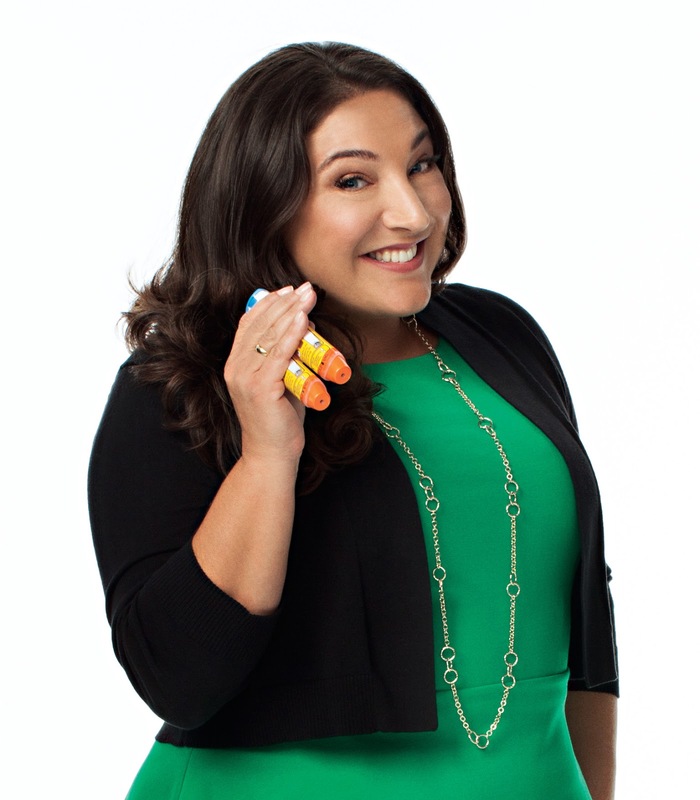 Jo Frost: A great partnership, actually, and one I felt very passionate about because we are campaigning and celebrating the 25 years of EpiPen. (At) the age of 4, I ate a shrimp at a family gathering, and my parents saw the signs and symptoms and rushed me to the hospital, where I was given epinephrine. L.A. Story: What should parents know when it comes to anaphylaxis? Jo Frost: On the show, we travel around the United States and internationally, and I have a 3-step action plan which I use and I think is very important for people to know so they can be prepared themselves. And that is to make sure first and foremost that you can avoid all allergens. After that, know what those triggers are—know what the signs and symptoms are. Always carry two EpiPens or two injectors at all times because they’re no good at home, you know. Also, make sure you can call emergency medical care. L.A. Story: On your show Family S.O.S., you work with whole families vs. just the kids. What's that like? Jo Frost: It’s different in the way that the viewers are now getting to see that. That’s something fundamentally I was always doing. We just took so many hours of footage that we never got time to put it all in. So this format has been created to clearly show how the adults received the necessary education and advice. L.A. Story: What are your tips for parents who don't have experience with EpiPens? Jo Frost: I think most importantly, looking at families with kids who do show the signs and symptoms of anaphylaxis, hopefully one is aware that you are talking to your immediate family, family members, that you’re talking to the school and making sure they’re aware of the signs and symptoms, so that one can be prepared straight away that when we do see this that we follow through and take the EpiPen. L.A. Story: With summer here, which can mean lots of traveling, do you have any tips for parents of kids with life-threatening allergies? Jo Frost: For me, I’m somebody who does do that. Over the last 8 years, I’ve traveled around 47 states of America, so my work entails making sure I’m safe all the time and really vigilant about how I move forward everyday. So pre-planning and preparing is very key. For example, I work with children. My production company makes sure that the families are aware that there can’t be any peanut butter when I’m helping families. The kids have gotten used to me now that we can’t have that. I wanted to let you know about a cool upcoming event that's happening tomorrow, Tuesday, July 9. Actress and mom Jessica Alba (whom I interviewed here) will be at CB2 in Santa Monica, signing copies of her book, The Honest Life. The book is all about how to live naturally and lessons that Alba has learned along the way that have helped her to know more about children's health. There will also be refreshments and appetizers while visitors check out the book and CB2's home furnishings! Happy 4th of July! Hope you have a fun (long) weekend celebrating America's birthday! We actually haven't quite decided what we'll be up to -- maybe a bike ride on the beach, a short road trip, shopping? 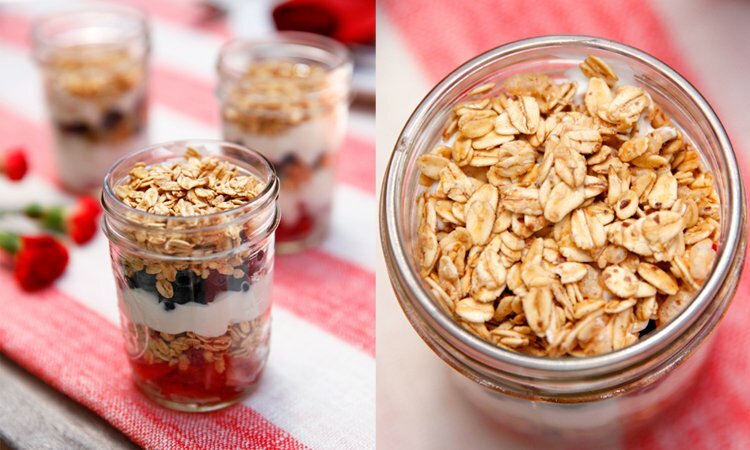 Remember to pack sunscreen, and if you'd like a yummy treat, try this holiday parfait (pictured above). You can find the easy recipe on mom.me. Allison Janney, right, and AnnaSophia Robb play a mother and daughter in "The Way, Way Back." Allison Janney, the versatile actress who's played everyone from a White House press secretary on TV to a singing office manager on Broadway, stars as a hilariously boozy and inappropriate mom in summer coming-of-age dramedy The Way, Way Back, which hits theaters July 5. Joining a fun roster of co-stars, including Steve Carell, Sam Rockwell and Maya Rudolph, Janney plays Betty, the overbearing next-door neighbor to Carell -- who plays against type as a boyfriend you'd tell any good friend to dump. 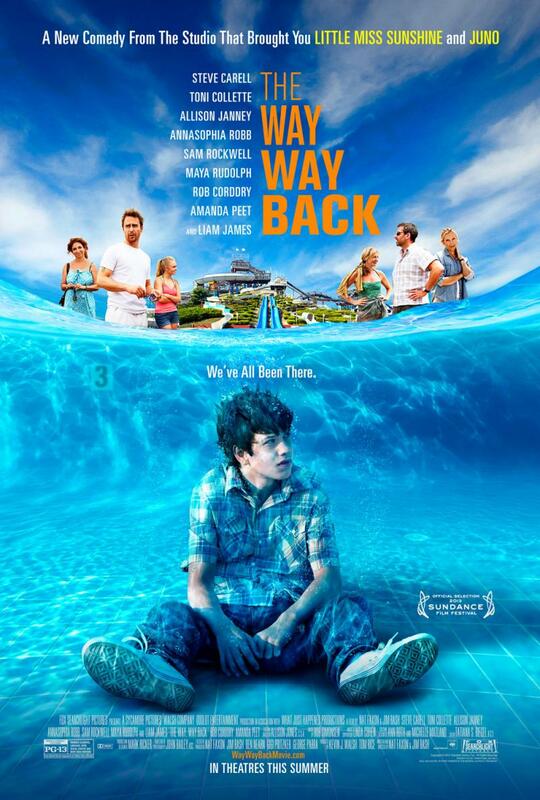 The Way, Way Back (PG-13), written and directed by Nat Faxon and Jim Rash, is a poignant coming-of-age story of 14-year-old Duncan (Liam James), who's spending the summer with his mom, Pam (Toni Collette); her boyfriend, Trent (Carell); and his daughter, Steph (Zoe Levin) at a beach house on the East Coast. After near-constant mocking from Trent, the introverted Duncan decides to ditch the fam and find his own path to summer happiness and stumbles upon the Water Wizz water park, which is run by the gregarious and offbeat Owen (Rockwell). Along the way, Duncan finds a friend in Betty's daughter, Susanna (AnnaSophia Robb). L.A. Story: You play a mom in The Way, Way Back. Was there any advice from your own mom that you've taken with into mom roles? Allison Janney: That's a very interesting question. My mom inspires my for every role I do. My mom is in every role I do. There is some aspect of her. She is one of the loveliest women, but also very funny. She doesn't know why she's funny, which makes her even funnier. And I think that's what I strive to bring to characters like her, because I'm not a comic. I'm not a stand-up comic. I just know behavior is funny, and I know why it's funny. L.A. Story: You star with such fun actors like Steve Carell and Toni Collette. And Steve Carell plays so against type in this. What was it like on the set with those two actors? Allison Janney: We had a couple of fun nights, especially when we were waiting around to film a scene where the screen directions said, "The adults stumble into the dunes," and that's all we had to do. So, we got to hang out in one of the holding houses together—he, Toni Collette and I. We had a great time getting to be just silly and sharing stories about summer vacations. He was really fun to hang out with. I wish I'd had more scenes with him. I also learned it's very hard to act on a boat, in a rocking boat. I'm looking out at the ocean. I'm down in Santa Monica, and I just was remembering that day out on the boat with Steve and Toni and Amanda (Peet). Amanda was getting sick, and we were all just feeling that it's really hard to act on a boat all day. But, he definitely makes anything more fun. Yes, we kind of fell off the grid last week. We were in Oklahoma! I know I should have mentioned it, but with laundry, packing and basically fitting three sets of clothes into one suitcase (I hate luggage fees! ), I kind of dropped the blog ball. But we're back from Oklahoma, and I have lots to share -- including our visit to the super-cool Pops Soda Ranch in Arcadia. The Route 66 pit stop has more than 600 kinds of soda on hand! I just have to unpack now, and then I'll be back with fun Oklahoma stuff and my interviews with Supernanny Jo Frost and Allison Janney, who's starring in summer movie The Way, Way Back.